Ideally situated on the mystical Courthezon terroir, the vineyard is nestled between the round stones of Beaucastel and the red sands of Rayas. These are full-throttle wines with strong grip and rich fruit flavors – all the more so now that farming has been converted to biodynamics. Complex and racy, yet luscious and smooth, the various Cotes du Rhone blends offer pleasure and personality, while each Chateauneuf is marked more by position and process. 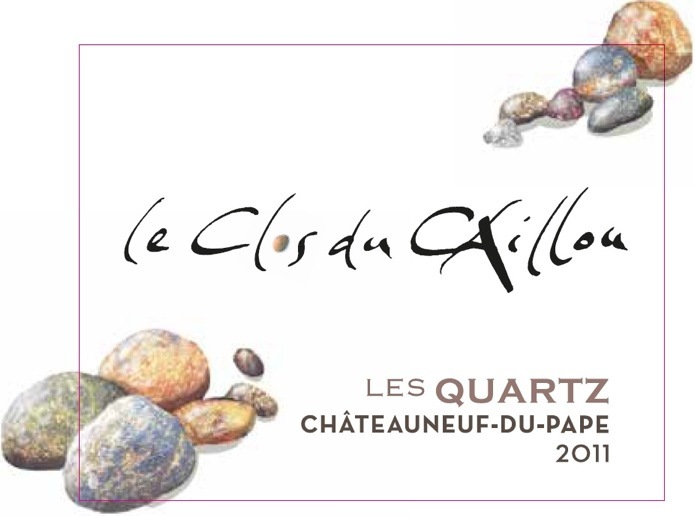 Owner: Sylvie Vacheron; vigneron: Bruno Gaspard; consulting oenologist Philippe Cambie. Red grapes: 48h planted – Grenache 80.5%, Syrah 7.5%, Mourvedre 6.7%, Cinsault 3%, Carignan 1.3%, and Counoise 1%. White grapes: 5h planted – Roussanne 53%, Grenache 20.5%, Clairette 18%, Viognier 4.5%, and Clairette 4%. Cotes du Rhone Bouquet des Garrigues Blanc, 2014….Pink Clairette, blended with 30% Grenache – delicious white peach, citrus blossom blend with medium-bodied richness and a clean, quaffable profile. ‘Chateauneuf-du-Pape’ les Safres Blanc, 2014…..Half Roussanne, and equal parts Grenache and Clairette, fermented and aged in older barrels – peach, pear, cream, toast flavors and terrific purity. Cotes du Rhone Le Caillou Rouge, 2014…..Loads of spice, thyme/rosemary, and hints of leather, crushed flowers on the nose; medium-bodied, elegant and textured, with sweet tannins. Cotes du Rhone Le Nature Rouge, 2015…. Cotes du Rhone Quartz Rouge 2013….More perfumed and spice-driven, with ripe, up-front notes of black licorice, cherry, and ground herbs – big, rich with solid mid-palate depth. Chateauneuf-du-Pape Tradition Rouge, 2013…..Pure Grenache and inaugural release of this plush, full-bodied, fruit-forward wine – plenty of kirsch and licorice, pepper and spice. Chateauneuf-du-Pape Quartz Rouge, 2011…..As if on a magic carpet, this wine lifts us straight to Provence – bursting with sweet blackberry fruit, ripe tannins, and a finish like a French kiss.